Pictured: Brenda McCarthy of the Irish Cancer Society on the right, Everna Corcoran-Mills in the middle, Linda Drochmann, on the left. 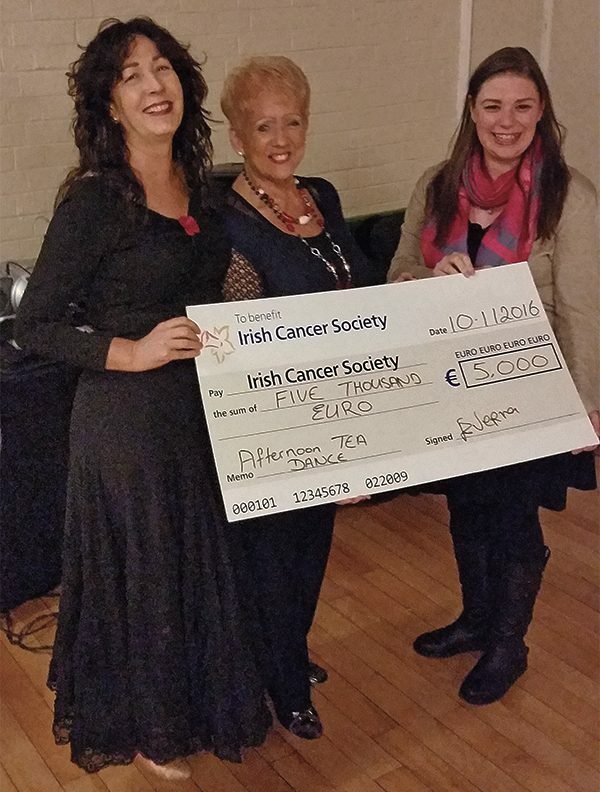 Early October saw an afternoon tea dance at Bective Rugby Club in Donnybrook to raise money for cancer research. The event was organised by Everna Corcoran-Mills of City Dance Centre, who was moved to stage the event after being touched by the disease in a quite extraordinary way. Corcoran-Mills, who has been running ballroom dance classes every Monday and Thursday at Bective, had five clients who became close friends pass away from cancer in 2016 alone. “Having lost these friends it certainly had a big impact on my life and I vowed to help in any way I could to raise money to help others. In our studio we have several cancer survivors and it is from these good people that hope has been given to us all to help fight this disease,” said Corcoran-Mills. And Corcoran-Mills has certainly had an interesting career, from taking her first tentative dance steps at age three, to winning many Irish feis awards, working on cruise ships and finishing first at the British Dance Championships an impressive four times. Aside from the unfortunate events of this year, classes at City Dance Centre have often led to more positive results and even marriage, resulting in Corcoran-Mills teaching some of her students how to perform a first dance at their wedding. 275 energetic people attended the fundraising event, which took the form of an afternoon tea dance. Music was provided by J.K. Sound and the participants engaged in endless hours of ballroom dancing and generous donating. Bective Rugby Club also played their part by offering the venue free of charge. An impressive five thousand euros was raised and later presented to a very grateful Brenda McCarthy of The Irish Cancer Society.